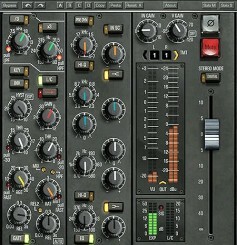 Waves eMO d5 Dynamic Plug-In including gate. The noise gate is a valuable tool in the professional sound operator’s toolkit. It can be used to shape transients and reduce noise in a range of recordings, including broadcast voice-overs and narration. Here’s a look at how noise gates work. A gate is a dynamics processor. It will reduce the gain of any audio signal below a certain point. A gate can make a quiet passage quieter and can help to isolate recorded signals that are subject to noise bleed. It can be in the form of a plug-in or a hardware component. Gates are similar to compressors in that their processing is dependent on a level-based threshold set by the mixer. While compressors attenuate signals above the threshold, noise gates attenuate signals below it. Any signal louder than the user-defined threshold passes right through, but any signal quieter than the threshold is sharply reduced downward. In a white paper from Waves, a developer of audio plug-ins and signal processors, the difference between gates and expanders is clarified. Gates operate at extremely high ratios, typically 100:1 or higher, meaning that once a signal falls below the threshold, its gain is reduced to 1/100th of what it was before. In a practical sense, when the gate is closed, the signal is muted to the noise floor. Most noise gates also include an expander option for a less extreme form of gain reduction. When using an expander, signals that are below the threshold are reduced at a much less dramatic ratio — usually around 2:1 or 4:1. At a 2:1 ratio, a signal below the threshold will have half of its original gain. In essence, Waves said, the only difference between gates and expanders is that gates operate at extremely high ratios, inducing a much sharper gain reduction below the threshold. At their core, gates are simple: they’re either open or closed. But setting how they are triggered and the timing of how they open and close is where greater attention to detail is needed. The main parameters of gates are threshold, floor, attack, hold, release and sidechain. If the threshold is set at -20 dB, only signals louder than that will pass through (example: -19.99 dB and above). Some gates have separate thresholds for when the gate opens and when it closes, which helps make a smoother exit as a sound decays. The floor sets how far down a gated signal goes when the gate is closed. If the user has the noise floor set as low as it goes, the signal will be completely muted when the gate is closed. If the floor is set to be in the audible range — say 12 dB below where the threshold is — then as a signal falls below it will be reduced by 12 dB. Attack controls how quickly the gate is opened once the signal exceeds the threshold. Hold controls how long the gate stays open after the signal exceeds the threshold, regardless of when the signal drops back down. This guarantees the gate to stay open for a set amount of time. Release controls how quickly the gate closes after the signal falls below the threshold, or after the hold time runs up. The attack and release settings shape the way a gated signal sounds and greatly affect how it cuts through the entire sound mix. Some noise gates include internal sidechain options, which allows the gate’s trigger to see only a limited portion of the frequency spectrum. Use this to fine-tune the performance of the gate so it reacts more closely to the desired signal, instead of being misfired by surrounding noise bleed. Start with the threshold turned all the way up (0 dB), then slowly reduce it until you begin to hear the signal pass through the gate. Set the gate's internal (or external) sidechain to finely tune the performance of the gate. The goal here is to have the gate’s trigger focus on the desired signal. Then, switch back out of the sidechain monitor mode and make sure it’s triggering how you want it to. Adjust the time settings. Start with a quick attack time and increase it until the key sound becomes fairly softened. Then, pull it back to find the desired amount of punch and snap. Listen within the context of the whole recording to find the best amount of transient punch. If you need to space out the time between the gate’s opening and its release, increase the hold time a bit, or try decreasing the separate closing threshold. Find what works best for the specific sound you are recording. Increase the release time to make the gate close more gently, or decrease to make it close more quickly. It is desirable to have a decay that is smooth and gentle, but is quick enough to close before unwanted noise becomes obvious. If the closed gate's muting effect is a little too clean or too dramatic, try increasing the floor setting or switching to expander mode. Sometimes a touch of bleed or room tone can work well to make a mix sound believable and alive. Proper use of a gate requires experimentation. Work with small changes to find the best setting for gating the signal. This will vary with each session. However, when done correctly, gating can help make audio sound clean and finished.